On the basis of an excerpt from Partisans, Cunningham was awarded a 2014 residency at the Yaddo colony. "Always, everything we see challenges us to understand. The extent to which we take up the challenge by our own wits and without resorting to prior interpretations is the extent to which we escape oppression." blowing dust that got in under doors." "Still, even in the quiet of your room you face the onslaught. Endlessly you work to clear your vision against the day's overcrowding. You seek a single sheer coherent narrative of thought, the prolonged extension of a tone amid the broken broadcast noises, antic and ever-changing. You school yourself in history. You labor to remember: underlying the current complexity is woeful oversimplification. Meanwhile you will know the truth by the serene simplicity of its surface." War, Art, Ambition, Perception, Subversion. You can't be any more specific? A writer who worked in the Northwest Territory like me. A compatriot of anyone espoused to the humane imagination, the powers and possibilities of consciousness as opposed to mass perceptions or the dilutions and mediations of systems and 'high' technologies. 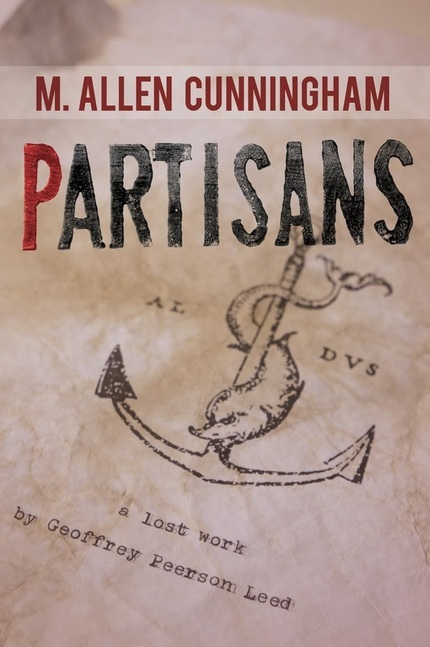 Is Partisans a political book? No. Though many things are. How did you come to edit and publish G.P. Leed's lost manuscript? Will its publication put you in danger? Probably. But that's true of every book. Art is the result of having been in danger. You're quoting someone, aren't you? Yes. Of course everything is a quote in its way. Is Partisans a quote? What of? Oh, Don Quixote and many other things. It's not for me to say but for the reader to perceive. Where is the Acknowledgements page? Leed never included one. Why should I? Refer to answer above. Was G.P. Leed for real? Was Jules Renard or Cervantes, or Janos Lavin? What are your hopes for Partisans? They're no different than Leed's were, and those are plain to see on every page. Read the book, you're saying. Leed himself writes, "Dare the reader to understand!" But would you really call most readers daring? Who are the most daring among them? Those who go first, naturally. Partisans is a lost work by the mysterious writer Geoffrey Peerson Leed, presented in nine parts according to Leed's designs as indicated in manuscripts discovered after his disappearance. The book describes a brutal war in an unspecified past as well as Leed's struggle to survive in a paranoiac future riven by totalitarianism and social decay. Everywhere at its heart, Partisans speaks boldly to our contemporary moment: a time of unbridled surveillance, constant war, and maddening technological upheaval. M. Allen Cunningham is the author of the novels The Green Age of Asher Witherow (a #1 IndieNext Pick) and Lost Son (about the life and work of Rainer Maria Rilke), the illustrated, limited-edition short story collection Date of Disappearance and two volumes of nonfiction, The Honorable Obscurity Handbook and The Flickering Page: The Reading Experience in Digital Times. He lives and works in the Northwest Territory. G.P. Leed lived and worked in the Northwest Territory.